For us seasoned Revit users, worksharing is a part of daily life when performing concurrent edits on our own model. Until now, these methods have been on-premise. With Revit Server, we extended worksharing over the wide area network. However, this was just an adaptation of on-premise worksharing. Neither methods solved the issue of working on the model from home or remotely. Nor, did they streamline the collaboration with models from our extended project partners. Instead, we continued to pass our models back and forth each week using a shared cloud repository in order to coordinate across disciplines. However, the partners’ models were only as up to date as the day we downloaded and refreshed them. The unintended consequences of this methodology produced a lot of unnecessary overhead. Someone had to upload and download models to and from the cloud repository. Someone had to set up the elaborate networking environments and managing their reliability. Lastly, communication was still limited to the occasional phone call, web meeting, or email transmission. In all, the information for the project was still loosely disconnected and decentralized. Well, I’m glad to say the wait is over. Autodesk has finally delivered a solution that solves many of these limitations which have slowed our collaborative project process and eliminated most of the IT overhead. 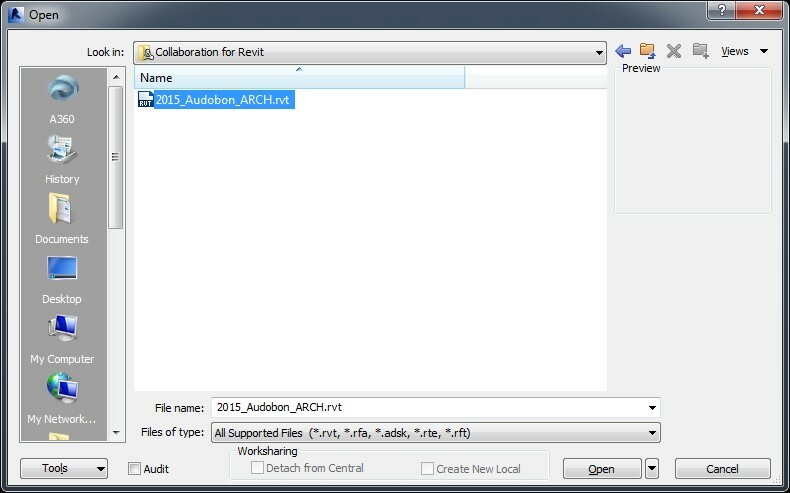 Autodesk A360 Collaboration for Revit changes Revit worksharing from locally collaborative to socially shared. We’ve moved the Central Files to a common location in the cloud and collaborate on the models from virtually anywhere provided we have an internet connection and entitlements to the service. The way this works is through a bundled service. 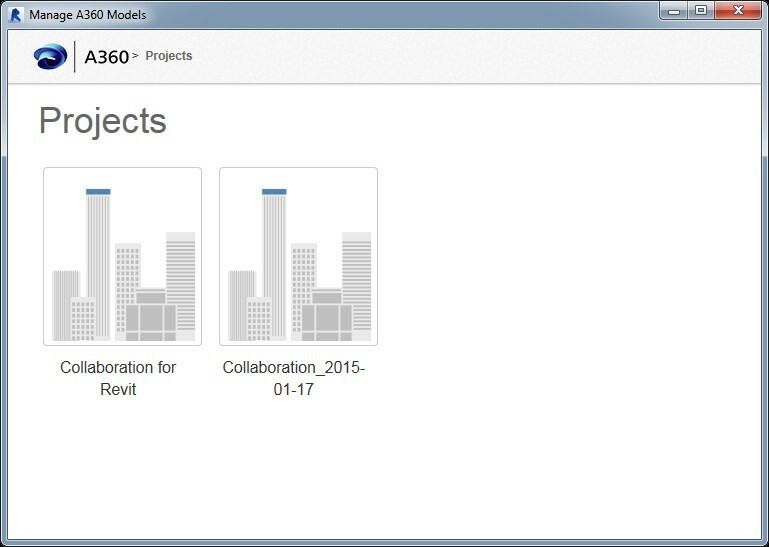 Autodesk 360 Collaboration for Revit works in tandem with the A360 Team project collaboration platform. How do you begin? Firstly, an individual within the company, typically the Autodesk Contract Manager, needs to purchases enough subscriptions to Autodesk A360 Collaboration for Revit to accommodate the necessary number of users. Following a confirmation email from Autodesk, the Contract Manager clicks a hyperlink in the email that redirects the Contract Manager to their Autodesk Account site. 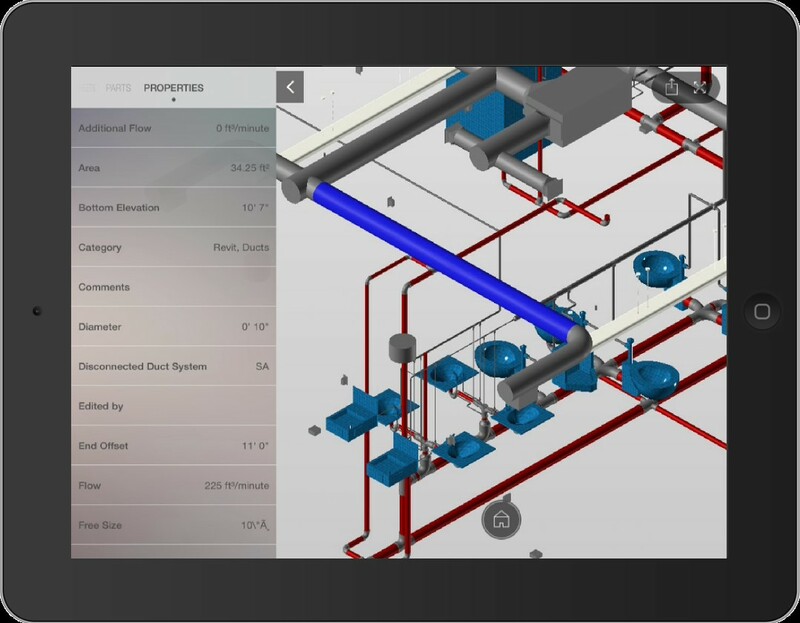 Under Products and Services will be listed the A360 Collaboration for Revit and A360 Team entitlements. At this point, the Contract Manager goes to the user listing and assigns specific users a single entitlement of A360 Collaboration for Revit. The Contract Manager needs to designate at least one user in the organization with an entitlement to A360 Team in order to set up an A360 Team Hub. A Team Hub associates people, projects, and data in a centralized location. After entitlements are issued, those users will receive an email from Autodesk describing changes to their personal Autodesk accounts. The email also contains a hyperlink that redirects the users to their account site and lists the new entitlements provided by the Contract Manager. If any of the users are entitled to access A360 Team they can access the service to begin creating their own A360 Team Hub. 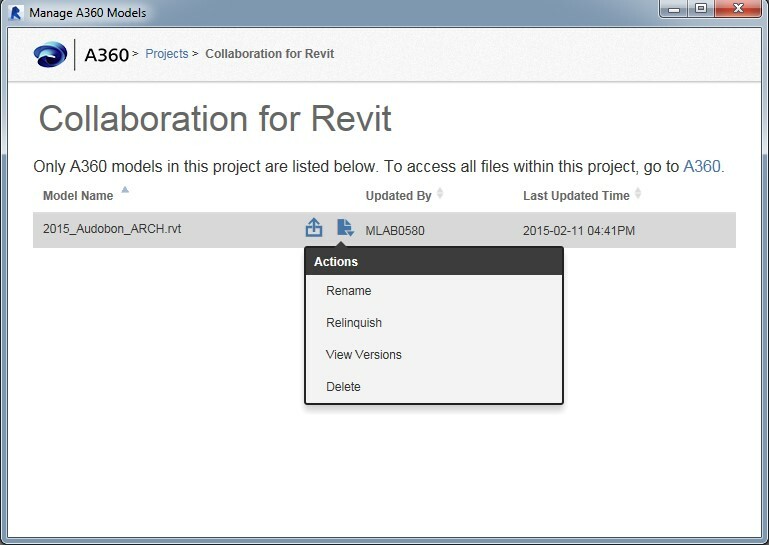 When the users access their A360 Collaboration for Revit entitlement they are redirected to the product site for Revit to download and install the A360 Collaboration for Revit add-in. It should be noted that each Revit seat have Update Release 5 installed prior to installing the A360 Collaboration for Revit add-in. Let’s first look at the A360 Team Hub. The owner must set up the company’s membership. A360 Team has a series of Roles and Permissions that each member can be assigned. In A360 Team, there are team roles and project roles. The team roles consist of the Team Owner, one or more Team Administrators, and multiple Team Members. 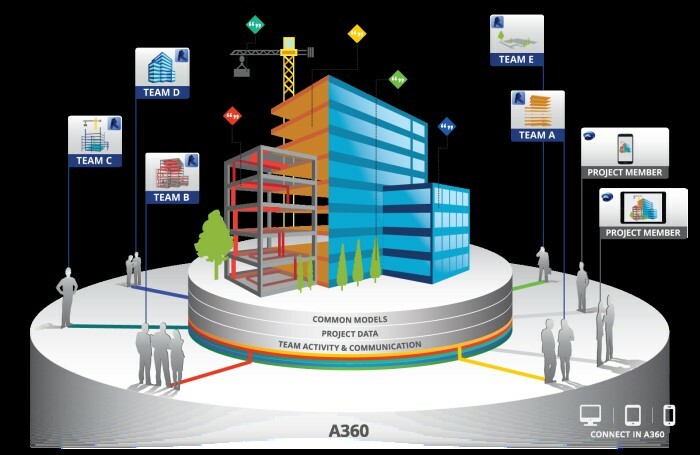 Users with an A360 Collaboration for Revit entitlement internal and external to the organization can be invited to join the A360 Team Hub as Team Members. Team Administrators can be elected from the pool of Team Members. Team Administrators can dictate who signs up as a Team Member and who those Team Members invite to projects. Team Administrators can also promote another Team Member to be a Team Administrator. The Team Owner is the user that sets up the A360 Team Hub and is also considered a Team Administrator and Team Member. On the project side, there are internal and external project roles. First there are the internal roles. When a Team Administrator or Team Member creates a project, they become the Project Owner. The Project Owner is also the acting Project Moderator. A Project Moderator, if permitted, can invite and approve additional Project Contributors. The Project Moderators can also designate other project Team Members to be a Project Moderator pending approval from the Team Administrators. Finally, we have the external project role which is the Project Contributors. These are individuals invited to your project from outside your organization that use the free version of A360 and only need to view the Revit files. Project Contributors can only access information in projects they’ve been invited to. Project Contributors can only invite additional Project Contributors pending approval of the Project Moderators. With the membership in place on the A360 Team Hub, a project can be created to house the Revit Central Files. When a Team Administrator or Team Member creates a project, they must input several pieces of information. The project’s Name and Purpose are first. Then, the project type must be decided. There are three to choose from. Open projects are accessible to the Hub of Team Members and can be accessed and joined without invitation. Open projects do not permit external Project Contributors. Closed projects are visible to all Team Members in the Team Hub. Team Members and Project Contributors are permitted to join and access a closed project. Secret projects are only visible to existing Team Members and Project Contributors invited to the project. The exception to this is the Team Administrator. Team Administrators can see a Secret project they have not joined but cannot access the people and data. The final inputs are whether or not to invite Team Members and if permitted, Project Contributors. The Project Owner can forgo the invitation process until data has been uploaded to the project. As mentioned earlier the Project Owner or Moderator must invite Team Members with A360 Collaboration for Revit entitlements in order to work concurrently on the Revit models. This includes Team Members of other Team Hubs outside of your organization. Project Contributors will only be able to upload and download detached Revit models as well as, socially interact with the project team. Invitations to additional Team Members and Project Contributors can be sent from project’s profile page. As they join, they will be listed under the Project Members. Aside from the Revit Central Files, additional data necessary to collaborate on the project can be uploaded on the project’s profile page. A project calendar and Wiki page are also linked to the project’s profile page. With the Team Hub, project, and team membership established we can turn our attention to Revit. Within Revit, there will be some noticeable differences on the Collaborate tab of the Design Ribbon. The Worksets button will be disabled and a new Collaborate button is available on the Manage Coordination panel (formerly the Worksets panel.) A new Communicate panel is now visible and contains the Editing Request button (previously found on the Synchronize panel.) and the Communicator button. Finally, there is also a new Manage Models panel which houses the Show History and Restore Backup buttons (previously found on the Synchronize panel,) as well as, a new Manage A360 Models button. To collaborate on a project file, the user selects the Collaborate button. The project file must first be saved locally. Revit will prompt you to save the original project file. Once the local save is completed, Revit will display a new dialog that provides two choices on how to collaborate. The first option is to Collaborate within your own network. This is option is for on premise LAN worksharing or WAN worksharing using Revit Server. 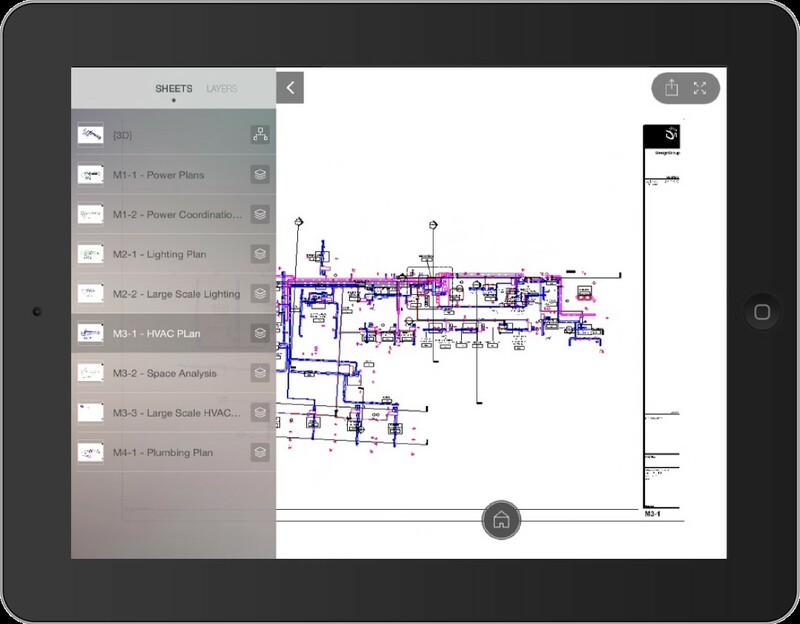 With this option, Revit will enable Worksets as it traditionally did in the past. 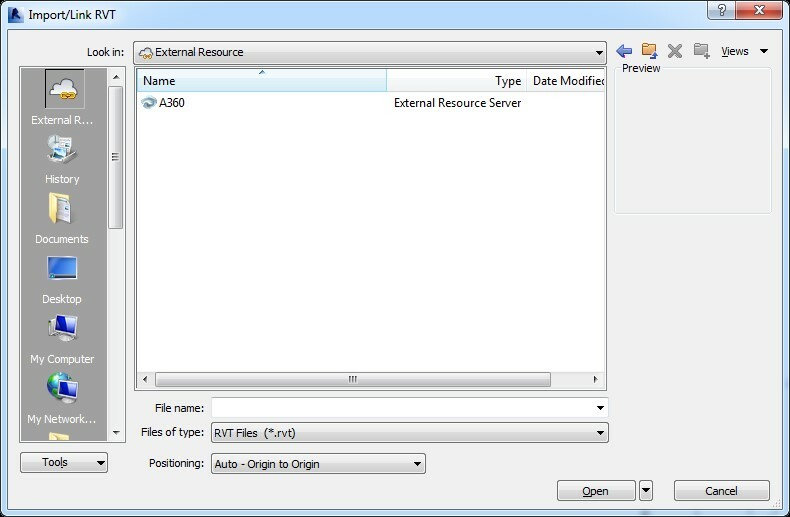 The file can then be saved on a Network Server or Revit Server as a Central File. The second option is Collaborate using A360. This is the option which will enable worksets and upload the model to an A360 project. Once Collaborate using A360 is selected, Revit will display the next dialog allowing the project file name to be modified and the A360 project to be selected. The process is commences once the Initiate button is selected. 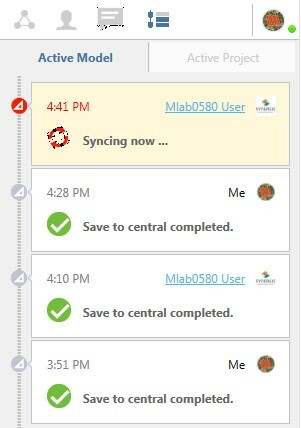 At this point, the third and final dialog displays indicating the enabling of Worksets, upload of the Central File to A360, and the saving of the model to the local cache. The project is now open for concurrent modeling by all Team Members of the project with A360 Collaboration for Revit entitlements. In Revit, A360 project files display differently on the Recent Files window. A small A360 icon is visible in the lower-right corner of the thumbnail image. Additional Team Members join the project by selecting open in their session of Revit. Next, they would select the new A360 shortcut visible on the Place List. Once selected Revit will display all projects that user is a Team Member of. After the Team Member selects the correct project folder, they need only select the Central File to work on and open it. When the A360 Revit project opens, the new Communicator panel becomes active. The Communicator panel is a live chat feed for all Team Members to share communications in real-time. There are five buttons across the top, four of which activate tabs in the main body of the Communicator panel. The first button is the My Projects button. 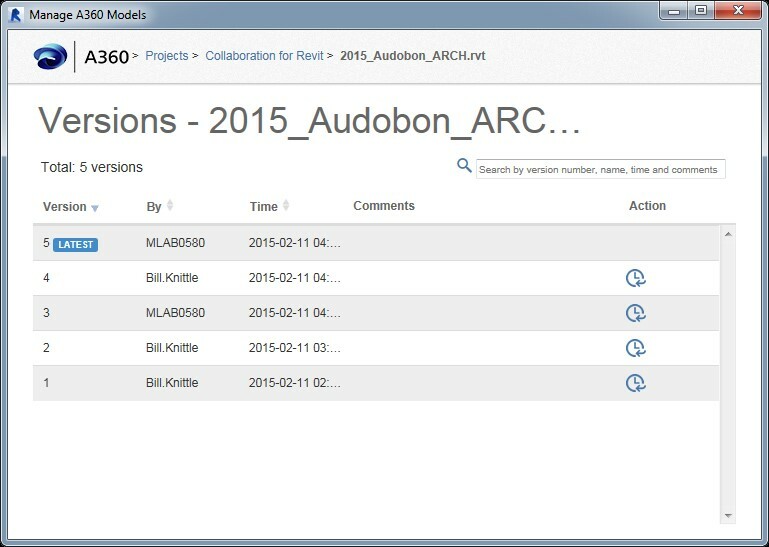 Here you can view the active A360 project in Revit and its communications as well as, closed A360 projects you are a member of and their communications. The Contacts button lists all contacts you’ve created through collaborating on A360 projects. The Chat button displays all current chat conversations and specialized communication tools. The Timeline button displays the syncs to central performed on models within the project or in project linked to your active project. The Member button indicates your availability and access to your profile settings. On the Active Projects tab, you can select the chat or email icon to send a communication to the entire project team. The settings icon launches the web browser to the A360 project site. Right-clicking on a Team Member allows you to chat with that individual or add them to your Contacts. Just below their name is an indication of a timeline event being performed or one that was completed. When chatting with a Team Member, you can send an image, capture the screen, send a file, and export the chat. Each chat conversation is day stamped and can be collapsed or expanded. Each chat is stored with the project and accessible at any time. Notifications display on the Chat button with a number value in a red box if you are not on the active Chat with the Team Member. The Timeline shows the chronological order of Sync to Central events over the life of the project as well as, syncs in progress. The user that has performed or is performing a sync is indicated in the event. Active timeline events will be indicated in red while finished events are indicated by a green check-mark next to the action performed. Each sync is date and time stamped. Simultaneously, Revit is creating a version history of the model as syncs occur. At any given time, you can navigate the buttons to visually see all events and communications in your A360 projects. The Communicator can be closed and re-opened by selecting the Communicator button on the Collaborate tab of the Design Ribbon. In some cases, it has been known to disappear from the interface. 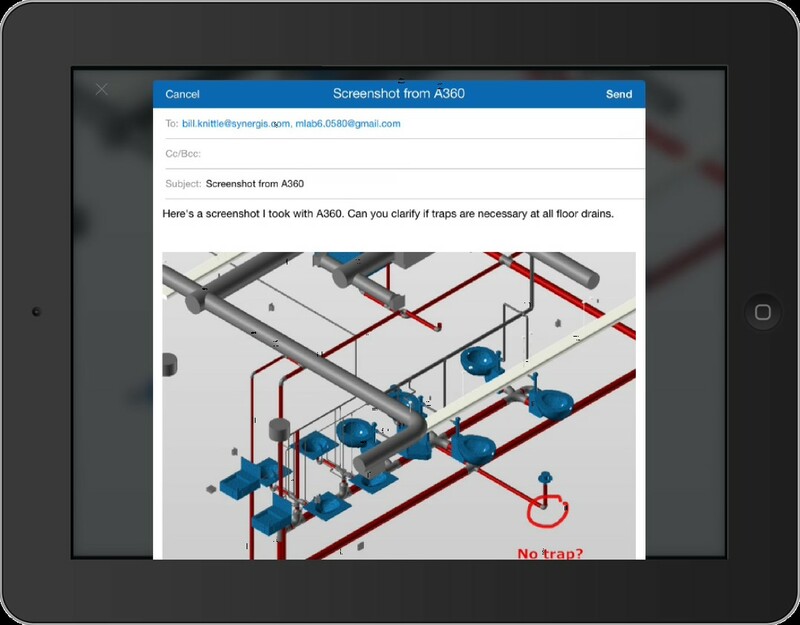 Autodesk has releases a knowledge base tip on restoring the Communicate panel on the UI. Refer to Communicator-Button-not-showing-up-in-Ribbon.html Basically, you will be required to reset Revit’s UIState.dat. All high-level model activities can be managed by selecting the Manage A360 Models button on the Manage Models panel. If an active project is not an A360 model, this button is inactive. When it is active, the button is active and will launch the Manage Models dialog to display projects you are a member of. Selecting the correct project reveals the Revit Central Files. From here, you can publish the model to update it on the A360 project page. You can also perform actions such as, Rename, Relinquish, View Versions, and Delete. When a member of the project team is not available, you can force their borrowed or owned elements to be relinquished. View versions lists all the versions of the model. As mentioned earlier, each sync creates a version. The version captures the date, time, and member’s name. All previous versions can be restored using the Restore action. Delete removes the file and members will no longer be able to collaborate on the project. 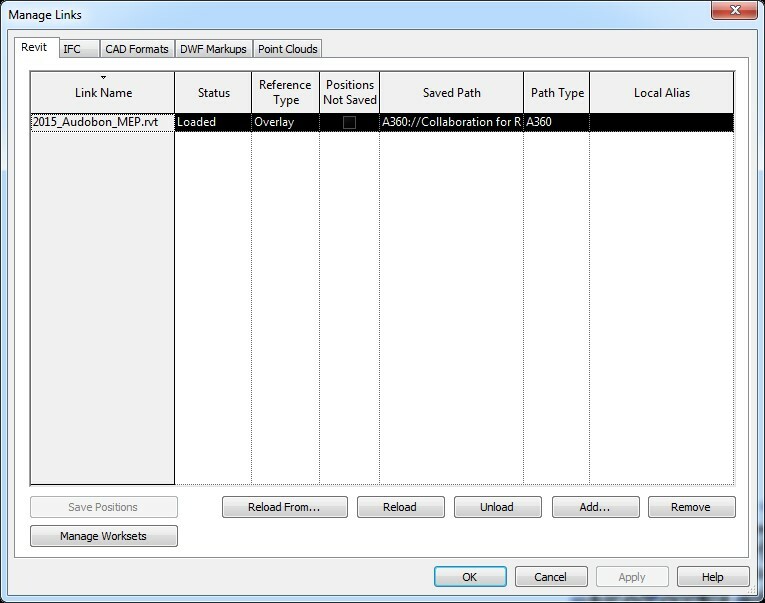 When it comes to linking Revit files, A360 is no exception. The workflow remains the same. You select the Insert tab on the Design Ribbon and choose Link Revit on the Link panel. In the Import/Link RVT dialog, there is an External References button on the Place List. In the explorer window displays A360. Clicking on A360 reveals the active project and available Revit files for linking. 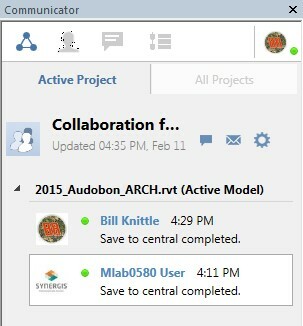 Once linked, the Revit files and their active members are visible in the Communicator. As updated syncs are made to the link file, they are displayed in the Communicator. Refreshing those changes in the host model remains the same. You can either right-click on the Link in the Project Browser to reload changes or, launch the Manage Links dialog to reload changes. Unfortunately, IFC, CAD Formats, DWF Markups, and Point Clouds are not supported. These files will need to be linked from a local server or share. One option is to upload and download them from the A360 project to a localized location for linking. With the models on A360, Team Members can now work from home without the risk we had using traditional worksharing. Another benefit is that Team Members and Project Contributors not using Revit can view the Revit models from the workstation, laptop, or mobile device. 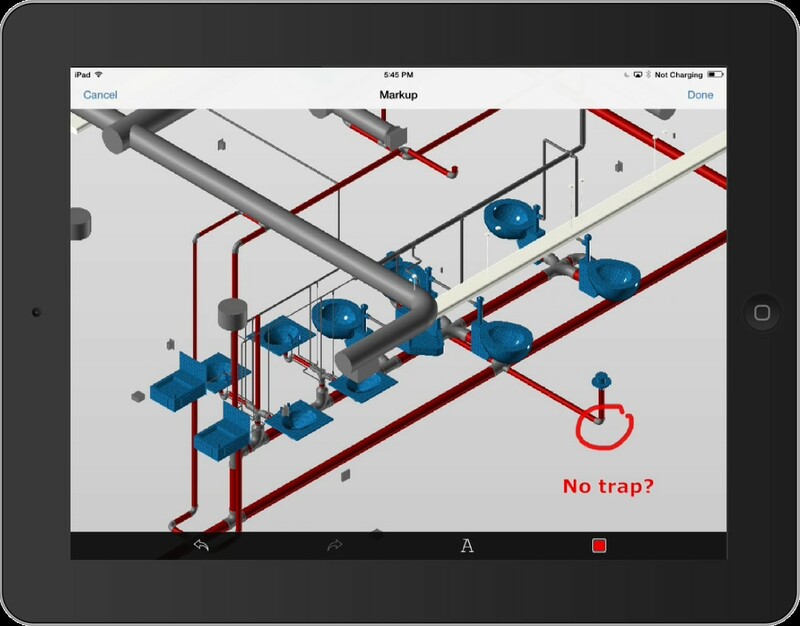 Using the A360 mobile app on the iPad provides secure access to the project. Navigating and exploring the Revit model and data is relatively easy. All the sheets in the Revit model are available for review. The mobile apps do have a limited markup utility. Once completed, the markups can be emailed to the appropriate project Team Members. In conclusion, A360 Collaboration for Revit in combination with A360 Team will mature and solve main collaborative pains in the Revit and AEC workflow to bring project members even closer together than ever before. Trial or purchase a license of A360 Collaboration for Revit and witness the change yourself. Want to see the video recording of this explanation? Watch it below. See Part 1, Part 2, or Part 3 of this series.